Saving the best for last, today project made with In from the Cold fabric is a fun tablerunner. Use any combination of 5 blocks from the block instructions. Click here for the tablerunner construction and yardage info. Let me say that I am in love with minatures and some may say that obsession is a better word. 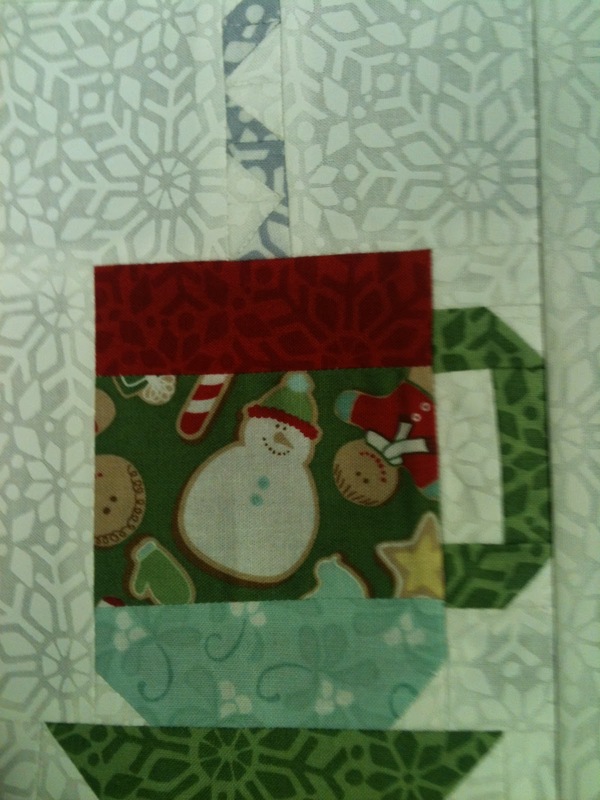 Working with the In from the Cold project sheet quilt was so fun, but when I did the mini’s my heart was racing. 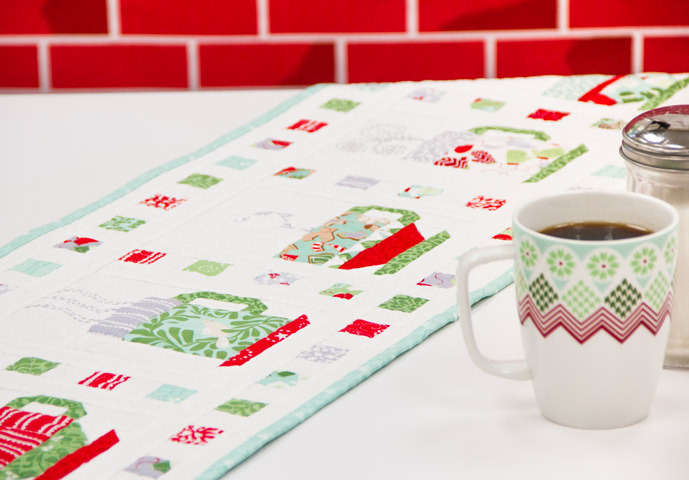 The table runner features the little mugs with a simple single square checkered border. 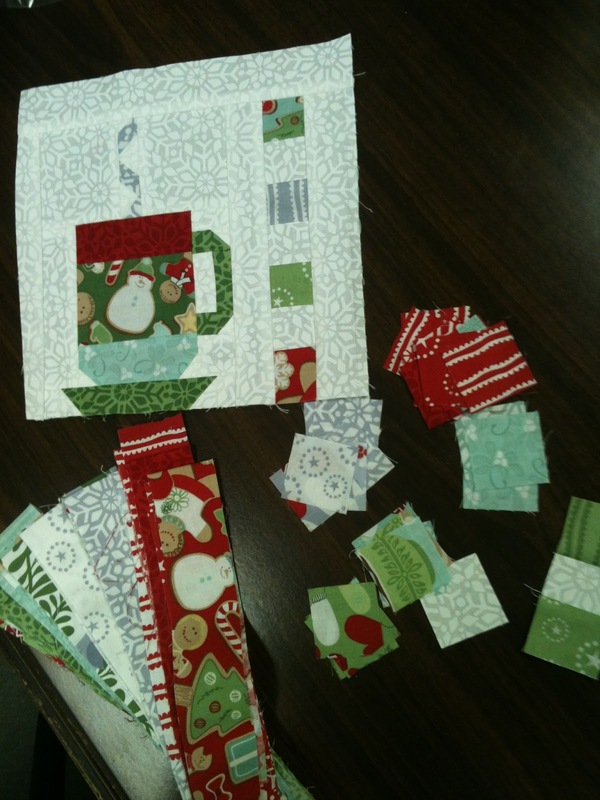 The 1-1/2″ squares were pilling up as I made the other projects and were begging me to use them. When working on any project, I always cut up my scraps into sizes that will be easy to use later. Good sizes to keep are 4-1/2″, 21/2″ and 1-1/2″. I should own stock in ziploc, these bags are great to keep colors together or theme fabric such as this. 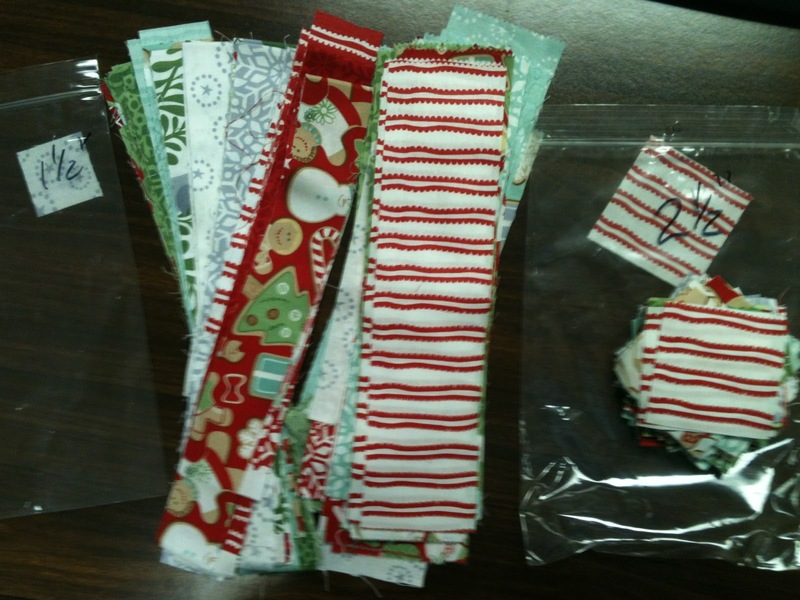 It is great for scrappy quilts when some of the precuting is done, and some times you just want to sew with no project in mind. Grap a 2-1/2″ container and start sewing. Some of my best ideas come form just sewing with no project in mind. Let you creativity go. Back to the project, if you are not into making mini cups again as mentioned in the placemat project yesterday, use any of the cute fabric as the 5 blocks. Or simplify the mugs by fussy cutting the cute prints. Now just sew a simple 1-1/2″ cut border around each one and finish up with the single square checkered border as shown in the pattern. Thanks again for joining me and Moda today. Tammy, this is adorable. Thanks so much for making and sharing these patterns. I have a question for you about saving your stash – you mentioned that you cut your leftover fabric into 3 sizes of squares. Are these the only shapes you cut? I’m asking because I’m at that point where I want to get rid of my messy stash and cut it into pieces of usable size and shape. Thanks. Keep creating! sew cute. Thanks for sharin. I adore this project! Definitely on my to do list. Thanks so much for a wonderful idea! Tammy, could you resend me the email about how you cut your scraps? I intended to save that email, but I think I threw it away by mistake. It sounded like a very logical (and do-able) solution to scraps!